If your clients are discerning travelers who want to try a different Caribbean getaway with almost-guaranteed perfect weather, history and culture, superb diving sites, plenty of activities, and a European feel, recommend the Dutch island of Curaçao to them. Curaçao (pronounced “Cure-a-sow”) is one of the ABC islands (Aruba, Bonaire, Curaçao) that’s perfect for the traveler who loves a tropical beach vacation that’s filled with rich experiences and isn’t overcrowded with Americans. This tiny island is located just 35 miles north of Venezuela and is part of the Dutch Caribbean, which refers to the islands of the Kingdom of the Netherlands located in the Caribbean sea. Though Amerindians already inhabited it for about 6,000 years, Curaçao was “found” by the Spanish in the late 15th century, then conquered by the Dutch in the mid-1600s. Formerly part of the Netherlands Antilles, Curaçao became an independent country in October 2010 but still operates under Dutch sovereignty. One major component that sets Curaçao apart from other Caribbean islands is that the country’s economy runs on oil, not tourism. The island’s biggest business is the oil refinery, which distills crude oil imported from Venezuela. Curaçao has a range of accommodations from budget-friendly to luxury five-star properties. Only a passport is needed and it’s a seamless flight from Miami and New York. English, Spanish, and Dutch are widely spoken on island. While the country’s currency is the florin, U.S. dollars are widely accepted. For a dry, hot climate (less than 22 inches of rain a year!) and beauty to that found in nearby Aruba, we found room rates, food, beverages, and activities to be more affordable in Curaçao than Aruba. Curaçao’s main tourism markets in North America come from Toronto, Miami (and connecting flights through there), and the New York tri-state area. These are primarily due to ease of travel (Miami has daily fights with American and Insel Air, Toronto is weekly with Air Canada, and New York is twice weekly with JetBlue, with a third flight coming later this year). The North American travelers tend to be between the ages of 25 and 65, with a high HHI, are well educated, and have traveled to the Caribbean before. While this beautiful island is perfect for a beach-lover, the traveler who visits here should want to try new things, learn about the history of the island and its people, as well as sample new foods. The island also welcomes an average of 400,000 cruise passengers annually at Santa Anna Bay or the Mega Pier in Willemstad. Languages: While English and Dutch are mostly spoken throughout the island, Curaçao was the birthplace of the Papiamentu language, a mix of Spanish, Portuguese, Dutch, French, English and Arawak Indian and is spoken through all levels of society. For travelers familiar with blue Curaçao liquor, they might have an idea of the water color to expect to see on this island, although the sea here is often a clear bluish-green and flanked by pristine white beaches. 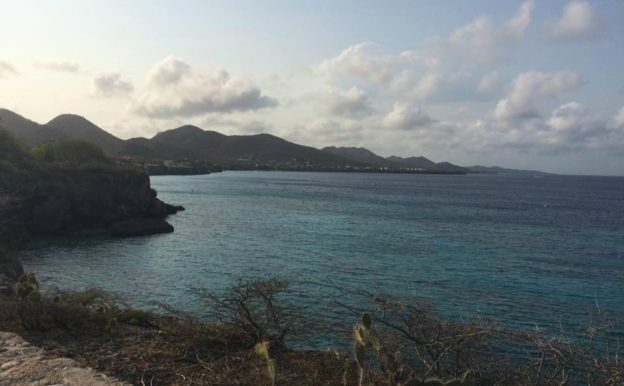 Curaçao has over 35 beaches on the island, and Beach Boys’ fans who’ve been in search for “Kokomo” will be pleased to find the real Kokomo Beach a beautiful, relaxing place to people watch during the day in Willemstad, the country’s capital and only city. Kokomo is known for its “full moon parties” and other parties throughout the year but it’s a mellow place to check out and swim during the day. Playa Knip (also known as Kenapa) on the northwest side of is another great beach to take a day trip to. The beach is free but bring money to rent lounge chairs and use the bathrooms. The Jan Thiel beach area is east of Willemstad, and busy with families and tourists during the day sunbathing and dining at casual restaurants. It has a vibrant nightlife scene at the bars and restaurants that scatter along the waterfont. Spend time walking through downtown Willemstad on your own or as part of a walking tour. This picturesque area is a UNESCO World Heritage site. Tourists often walk the iconic Queen Emma Bridge, which opened in 1888 and is an operating swinging pontoon bridge that connects the Punda (“the Point”) and Otrobanda (“the Other Side”) sections of the city. From the bridge, take photos of the Handelskad, a collection of multi-colored buildings along the waterfront, one of Curaçao’s most emblematic images. Check out some of Willemstad’s historic buildings which include Fort Amsterdam, constructed in 1634 to protect the island from pirates approaching Santa Anna Bay, and Mikvé Emmanuel-Israel Synagogue, which dates back to 1728 and is considered the oldest synagogue in continued use in the New World. Active travelers might want to explore hiking trails along Christoffel Mountain that range from 20 minutes to three-hour hikes if they want to summit the mountain’s 1,227 feet (the highest point on the island). Shete Boka National Park is a must-visit on the north side of that’s a favorite amongst tourists who want to experience Mother Nature at her finest–watching huge waves violently crash against the rocks. Visitors can also hike the trails and check out the beaches where sea turtles lay their eggs. Drive there on your own for a small entrance fee to enter the park or sign up with one of the tour groups that stop by this park as part of island tours. On their way to and from the airport, visitors might want to check out the Hato Caves. For a small admission fee, a guide will take guests on a tour through the park and the 1,500-year-old caves that just opened to the public in 1991. This island has been considered a favorite amongst divers for many years, due to its sunny, warm weather with calm conditions and 100 foot-plus visibility underwater. There are dive sites all over the island, with a popular one being the Curaçao Underwater Park, located on the southeast side of the island, that includes some of the most lush reefs on the island. Advanced divers might be interested in checking out island’s Superior Producer site was voted one of the “100 Best Dive Sites” by Scuba Diving Magazine in 2012.